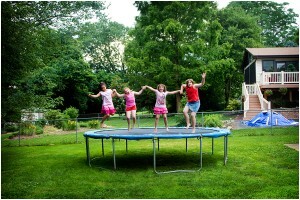 If you have not already got a Trampoline yet, you may want one for this summer! Whether its for your kids or yourself, trampolining can actually burn as many calories over a 10 minute period when compared to jogging for 30 minutes! So, not only is it fun, but its brilliant for strengthening your core and keeping fit. No doubt you will be fighting your kids for the trampoline now, but why not try out some games on there to pass time faster, as well as keeping your kids healthy and active whilst having fun! Below is a list of some of my Trampoline favourites. Start by forming a ring/circle of children all holding hands to complete the circuit. Then begin to walk around the circle with the centre of the jumping mat in the middle of the children whilst they sing ‘Ring around the Rosy, a pocket full of posies, ashes, ashes, we all do a …………’ – fill the gap with a trampoline move! You can choose from the following list if you are struggling for ideas: back drop, seat drop, front drop, even a somersault if the kids are capable! Crossfire is basically Dodgeball with a twist. It begins with several children around the trampoline base on the floor, with 1 or a couple of children on the Trampoline. 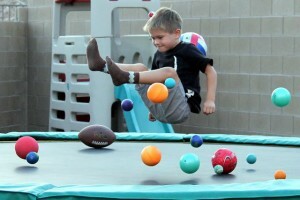 Those surrounding the Trampoline then have a collection of balls to throw at those on the Trampoline, who then attempt to dodge them by bouncing around, carefully avoiding each other. Find out who can dodge the most balls! This classic can be applied to almost anything, but it makes for particular fun on a Trampoline! Whilst one child stands off the Trampoline on the floor, they shout out specific commands. 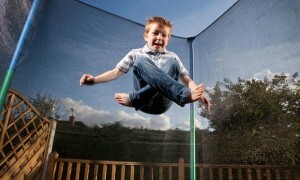 If the child does not start with ‘Simon says…’ and one of the children on the trampoline do command, they are out. You can only perform the command if the outside child shouts ‘Simon says…’ at the start. Last child on the Trampoline wins! Ideas for commands can be: stop bouncing, seat drop, spin in the air, bounce 3 times, and so on. One child is chosen to sit in the middle of the trampoline with everyone else circled around them. The middle child sits with their legs tucked into their chest and arms wrapped around to keep their knees in tight, whilst everyone jumps and the middle child cannot hold their hands together any longer – breaking the egg! The more children, the better, as it becomes bouncier and harder to hold onto your legs. Unleash your child’s inner creative side with chalk! 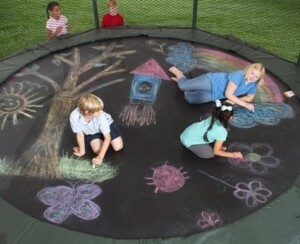 The jumping mat on your trampoline makes for a great canvass for kids to get creative on whilst remaining easy to wash with water. Sit them down and begin to draw, or if you are feeling extra creative, design games such as hopscotch! Last man standing! This game requires at least 2 people, and the more there is the better. Each player gets a few bounces in to get warmed up, players then count down from 3 so they perform a seat drop at the same time. You can only have one bounce on your feet and then one on your bum, you must then continue this cycle for as long as possible until the last man standing wins! If you bounce twice, simultaneously, on your feet or bum, then you are out. This game is basically tig on a Trampoline. 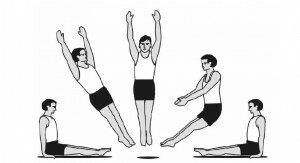 All players stand on the edge of the Trampoline, side on, with their outside hand on the edge of the net. The player who is on runs around the Trampoline chasing the others until they catch all of them. Once tagged, the players who are out must exit the Trampoline. Best played on a Trampoline with an enclosure, bouncing poison balls is great for a group of kids with too much energy and huge imaginations. The aim of the game is to throw 3-10 balls on a trampoline (different sizes makes for more fun) and bounce for as long as you can without being touched by a ball! If you get touched by one, you are out. To mix it up a bit, for every body part a ball touches, you cannot use it, i.e. if it touches your right leg, you can only bounce with your left! Whilst one player sits in the middle with their eyes closed, everyone else makes a ring around that person. One at a time, each person on the outside bounces in and taps the person on the back. The aim of the game is for the person in the middle to guess who it was that tapped them on the back. If they choose correctly, then that person swaps with whoever is on in the middle. I remember when I was a kid, I used to love playing the floor is lava and climbing all over the furniture in my house – although I don’t think my mum was a big fan. Well, this game is a similar concept except you play it with a ball on a trampoline. 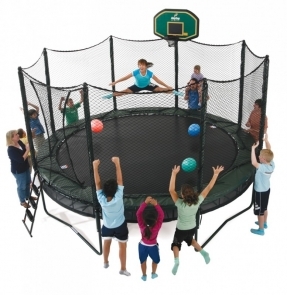 The aim of the game is to throw the ball, whilst you are in the air, to another person who must catch the ball in the air and throw it again before their feet touch the trampoline. If the touch the jumping mat, they’re out! You can make it more difficult for you and your friends by throwing the ball awkwardly – however, if its impossible for them to catch, you’re out! 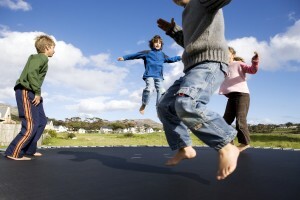 10 Fun Facts about Trampolines!